This vibrant bank by architect Rudy Baumfield, based on Le Corbusier's famed Ronchamp chapel, is next in our series profiling Palm Springs' many impressive mid-century buildings during the city's Modernism Week. Constructed in 1959, the Bank of America building takes cues from a design built five years earlier by Swiss-French architect Le Corbusier, as noted on a plaque on its wall. The bank's bulky overhanging roof and curved lines are representative of the Notre Dame du Haut chapel in Ronchamp, France. Formerly known as the City National Bank, the Bank of America building is covered in aqua-coloured tiles across its rounded south facade. The structure is more organically shaped than the geometric lines typically associated with modernism, but still fits with the style for its non-traditional form and lack of ornamentation. Located at 588 South Palm Canyon Drive, the bank is the shape of an obtuse triangle with rounded corners in plan – markedly different from the squared Wells Fargo Bank nearby. The surrounding area forms Palm Springs' small financial district, a place where architects vied to create impressive banks in the 1960s, and a hub of activity in the Coachella Valley at the time. 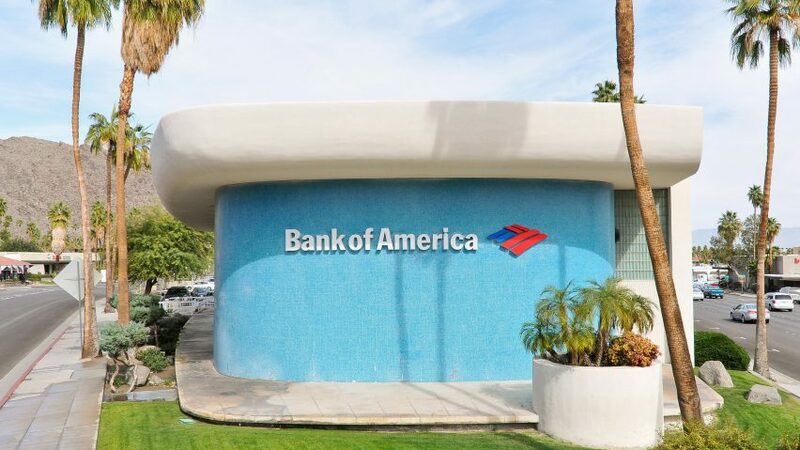 The white-pillared Coachella Savings & Loan bank, now a Chase branch, was also built at the time and designed by Ohio-born architect E Stewart Williams to resemble Oscar Niemeyer's presidential residence in Brasilia. "Each bank sought to capture customers by creating a significant presence through the use of outstanding architecture," said a staff report from the city's Historic Site Preservation Board. On the east side of the Bank of America, a large white exterior wall is broken up by three small turquoise portions and glass-block windows. Meeting a large parking lot, the entrance off Ramon Road is fully lined with glazing. A grid of aluminium-framed windows forms the west elevation, which is set back from the roof to shade interior spaces. Originally, the bank had a decorative aluminium sunscreen along its west-facing facade to shield from harsh sunlight. "Baumfeld noted the rounded curves were also inspired by adobe structures throughout the southwest," states the bank's plaque. Adobe homes are constructed from a composite of earth and organic materials — similar to rammed earth — allowing for interiors keep cool in the summer and warm in the winter. They are found in arid climates like the California deserts', and often have rounded walls, light-coloured facades and minimal exterior detailing. Baumfeld came to the United States from Austria in 1940, and designed many projects in Los Angeles — where he lived at the time. His 22-storey Tishman Building in LA's Financial District was the tallest building in the city when it was erected. In 1943, Baumfeld joined Austrian-born architect Victor Gruen and became a founding partner of Victor Gruen Associates. While practising there, he headed a wide selection of departments — including interior design, graphics, and store layout. He is also responsible for numerous shopping malls across the US. The Bank of America building in Palm Springs joins other modernist structures in the city, including Richard Neutra's Kauffman House and the Tramway Gas Station by Albert Frey and Robson Chambers. This array of buildings is celebrated during the annual Palm Springs Modernism Week festival, which runs 15 to 25 February 2018.